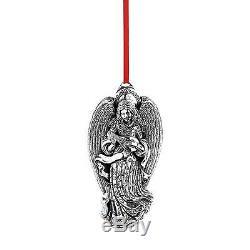 NEW 2015 Reed Barton Sterling Angel Victoria Christmas Ornament. 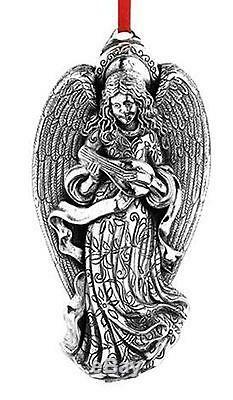 Reed & Barton is proud to present Victoria, Angel of Song, the thirteenth in a series of heavenly messenger keepsakes. Victoria smiles sweetly as she plucks the strings of her lute. The fine craftsmanship of this sterling silver ornament is exemplified in her beautifully decorated dress and delicately molded wings. Elegantly packaged, including a protective red flannel bag, for gift-giving and storage. Includes a red satin ribbon for hanging. 13th Edition Collectable ornament is engraved Reed & Barton Sterling on the obverse and has a flat back, suitable for engraving. This ornament is not dated. Keepsake gift box includes flannel bag and red ribbon H. This is direct from the factory, new in elegant box, complete with pouch and romance card. As a result, the following series are no longer in production: Sterling Angel, Santa, Williamsburg and Pierced Cross as well as the Silverplate Cross and Snowflake. The Lunt label has been totally eliminated. If by some small chance your item is not satisfactory, your return should still be received within 7 days or less. Be sure to check my other listings for more great Reed & Barton ornaments and crosses and other fine sterling and silver Christmas ornaments, collectibles, Victoriana, elegant glassware and more!!! Your store for more Christmas! It may be in the "To Be Listed" inventory. The item "2015 Reed Barton Sterling Silver 13th Angel Victoria Christmas Ornament Pendant" is in sale since Friday, August 28, 2015. This item is in the category "Collectibles\Holiday & Seasonal\Christmas\ Modern (1946-90)\Ornaments\Metal". The seller is "dkoldtiques" and is located in Barry, Illinois. This item can be shipped worldwide.